I was up early on the Sunday as I had a big day planned. Slipped in a quick breakfast at the cafe next to the hostel and checked out. By now, I was more or less familiar with the main streets of Belfast, yes, it is that small a city. As I walked through the main street yet again, fifth or sixth time in less than 24 hours, my destination was the Enterprise rental office. I had booked a car for the day to get out of Belfast and get further up north. Booking a car might sound a little fancy but I had to considering my situation. My plan was to get to the Giant’s Causeaway and Rope Bridge on the northern coast and to get there via the coastal route. 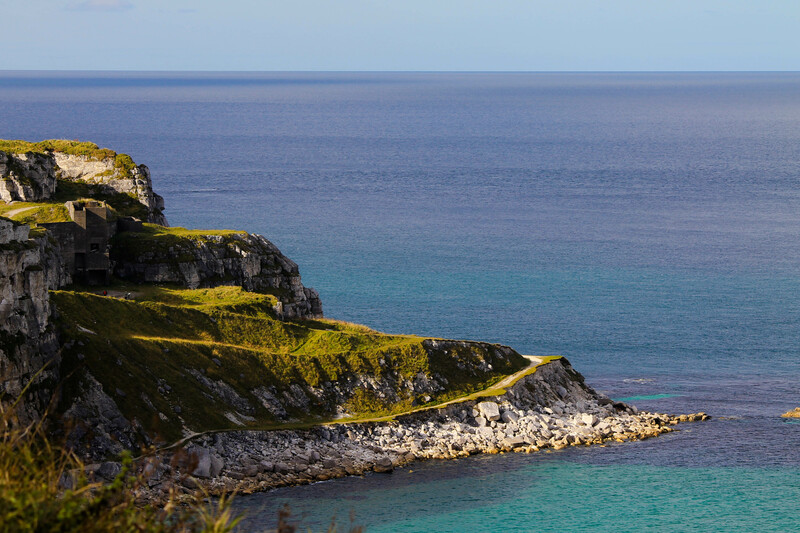 The Irish coastal that was famed to be one of the top 5 coastal routes in the world! I could have taken the regular coach tours that left Belfast on this route to same places, which was the cheapest option, but my first constraint was time, though the departure was okay, it would return back to Belfast only by 7pm and I had my ferry back to England at 6.30pm! So the coach tour was ruled out straight away. I worked out the costs that I would have to pay for the coach and for rental car+fuel and the difference wasn’t much. Infact, on a simple note I would suggest, if you are in a group then hiring a car and fuel would be cheaper than two coach tickets. Added advantages are many, if you love driving like me then this will be one of your best drives ever, you can move at your own pace, stop where you wish, eat where you want and the only disadvantage being the parking fee, which isn’t as dear as other parts of UK. Everything said and done, I signed the papers and took the keys of silver Peugeot 206 and drove out of the Enterprise parking. The Giant’s causeway could be reached in less than two hours via the motorway from Belfast but I wasn’t here to drive on yet another boring stretch, the brown boards written ‘Giant’s Causeway Coastal Route’ were my guide. As you drive out of Belfast, you first take the motorway upto some distance and then these brown boards start guiding you off the motorway. Before very late you witness the very sight that you came for, winding roads being caressed by foamy waves from the blue sea that stretches into horizon! Yes, the writing might sound very clichéd but sight, definitely isn’t! The day on which I visited being sunny made it even more enchanting. I cannot remember how many times but I pulled the car over at every opportunity to take pictures, to get-lost in the mesmerizing view or just to stand there facing the sea, talking business with the sea breeze. Solo travelling does give you some uncommon friends! 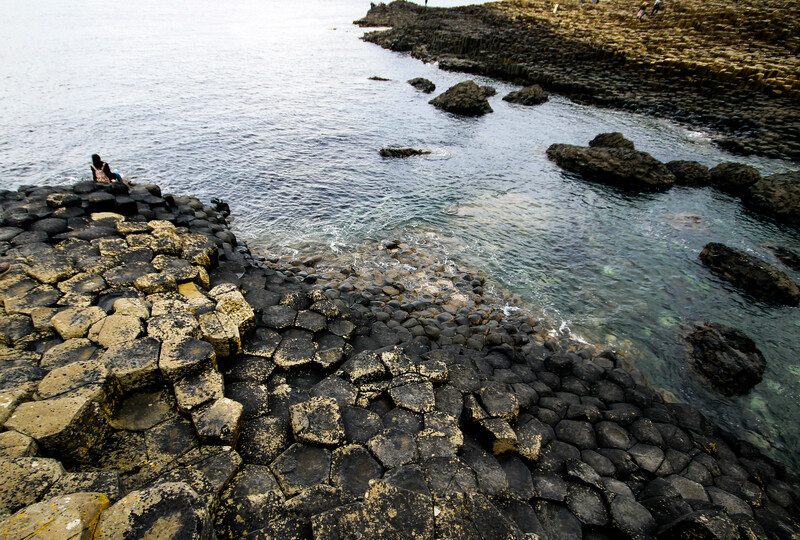 The Giant’s Causeway Coastal route is more of a revelation of how the local people have lived over the years in understanding with the sea and nature. The picture perfect villages that look like being sheltered under the mountains raising from the sea radiates the trust that keeps man & nature in unison. 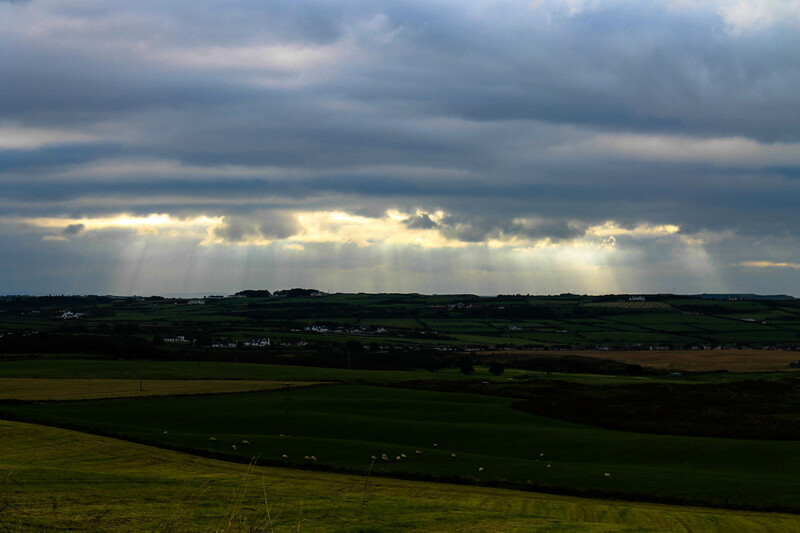 The road winds by the coast and climbs up the hill from where you get a view as far Scotland! I drove ahead and at a junction, I got off the main road on purpose, drove into a narrow road that went alongside a hill, my GPS was going berserk and if it had any hands then I would have been slapped! No detour has disappointed me till date and not did this one too! I arrived along with many tourists at the Carrick rope bridge on the North Sea by noon. The parking is free but you pay about £5 to walk on the bridge. It’s about a kilometre along the cliffs to the bridge from the parking place, with a fine view of the sea and rock stumps out of it. 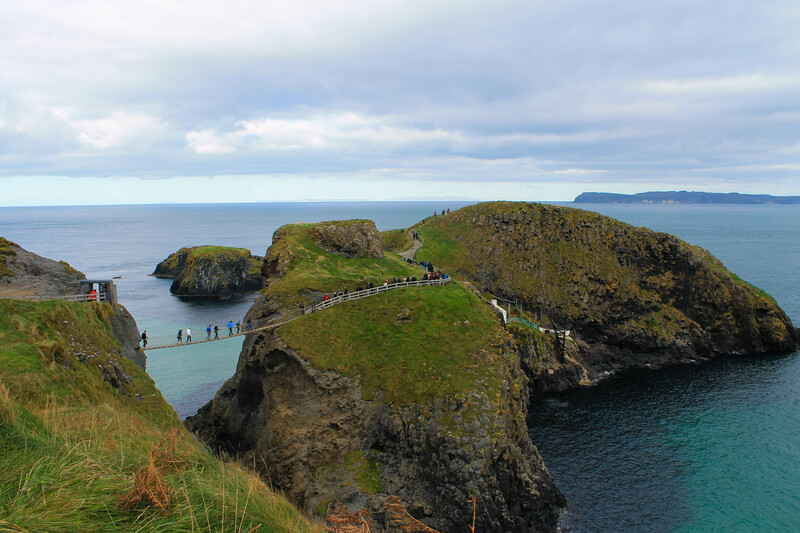 Carrick-A-Rede rope bridge is one of the most visited places in Northern Ireland and truly an adventure in itself. 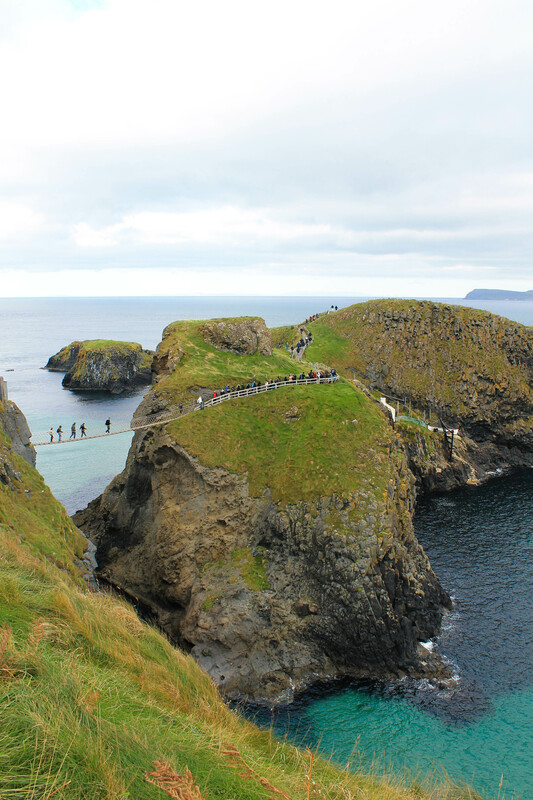 The official website say Carrick-a-Rede also boasts an exhilarating rope bridge experience. Traditionally fishermen erected the bridge to Carrick-a-Rede island over a 23m-deep and 20m-wide chasm to check their salmon nets. Today visitors are drawn here simply to take the rope bridge challenge! The rope bridge originally consisted of a single rope hand rail which has been replaced by a two hand railed bridge by the National Trust.” To get to the Carrick island from where they could get a better catch, the fisherman made this bridge to cross the sea. As I stepped onto the bridge, I realized why this experience had been so famous and not for the faint hearted ones! A bridge that was built completely by ropes with their ends hinged to the mainland and the Carrick island. It swung, tilted and swayed as we walked on the plank placed on the ropes, about 30-35 mtrs below you is the brimming North Sea and the winds that push the bridge makes it a complete adventure! It isn’t long but while you are on it, it’s worth the walk. The Carrick island boasts of bird watching in abundance, many of them sea birds and sometimes even some aquatic animals! 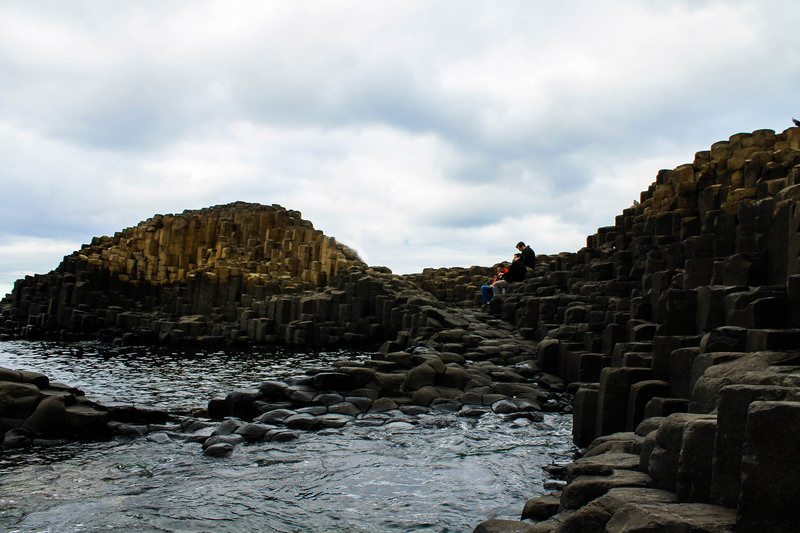 After the amazing experience of walking over the Carrick-A-Rede rope bridge, I drove towards yet another well known sights of the North Sea, the Giant’s Causeway! 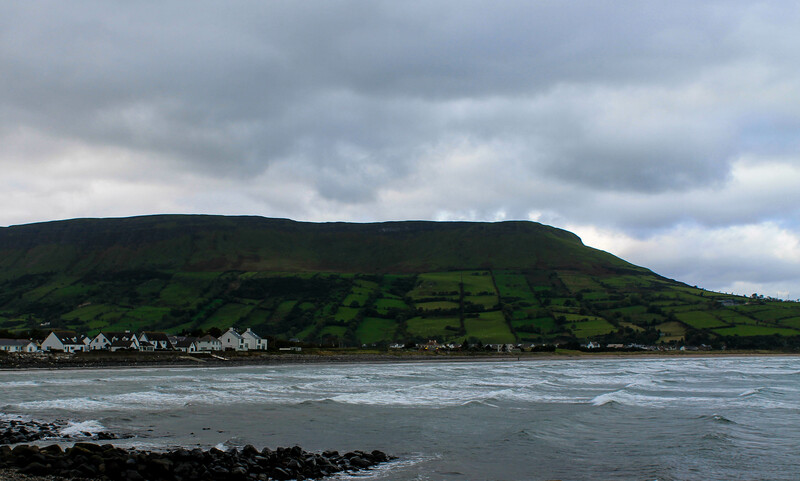 It is about 15 minute drive through another stretch of fine coastal country road from Carrick. A lot has been told and written about this natural wonder and it is even claimed as one of the World Wonders! There is car park available near the visitor centre for £6, which includes the ticket to visitor centre but the Giant’s Causeway is free for visiting. The visitor centre ticket is always confused as entry ticket to the causeway itself which is wrong. I chose to park further down the road, by the heritage railway station for £3 and walk towards the visitor centre, walk past the centre and towards the Causeway. It is again, about a kilometre from the visitor centre and goes along the sea shore. But here there is also a bus service available just in case you feel a tad lazy. £1 each way per person ticket lets you hop on the bus at vistor centre and hop off at the causeway. 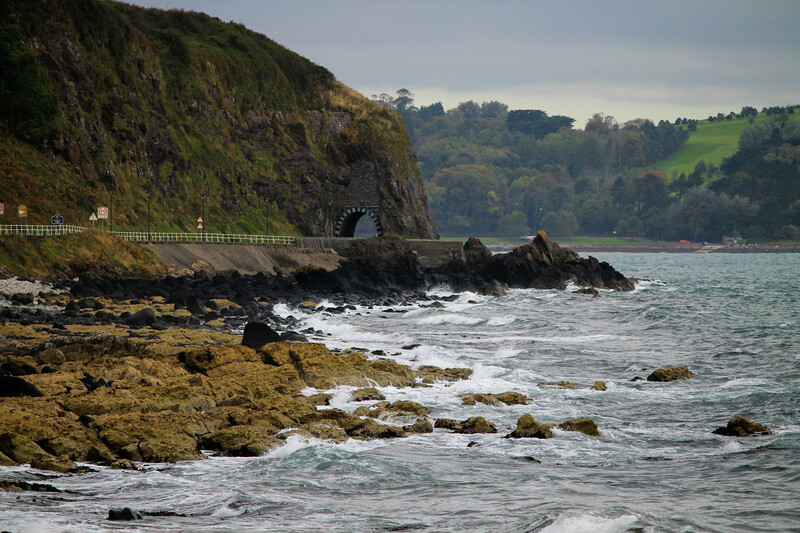 I was soon back on the motorway that connects the northern county of Antrim to Belfast. I had to get back to the Stena Terminal and catch my ferry across the Irish Sea before boarding the National Express 😦 at Caernryon to Birmingham, a good 12 hour journey 🙂 but I seemed to love it! As I swayed yet again on my second sailing in less than a day’s time, I finally was catching some sleep. 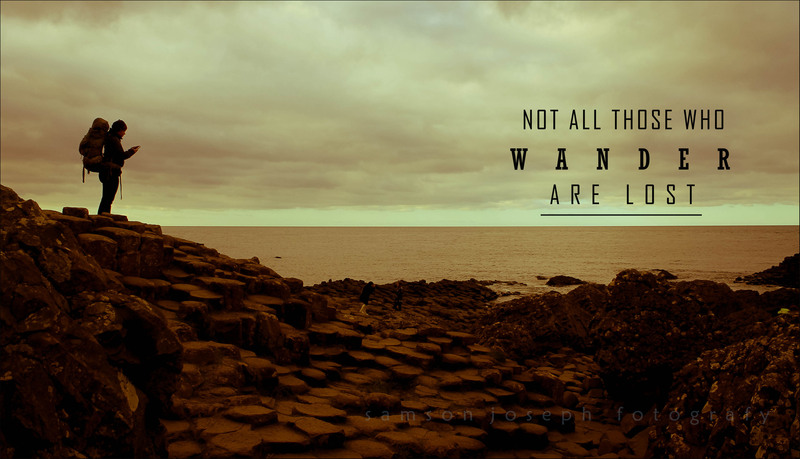 It was now mind over body and asking to take some rest and to put me to sleep was the fine views of Northern Ireland playing in the back of my head! Trip On! This is just :O Aaah, the pictures!! And the rope bridge. Gorgeous. I need to use my UK visa soon! !